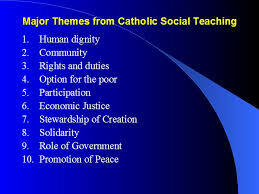 Catholic Social Teaching is a central and essential element of our faith. Its roots are in the Hebrew prophets who announced God’s special love for the poor and called God’s people to a covenant of love and justice. Catholic Social Teaching is included in the Church’s moral teachings and is intimately connected to the spiritual, sacramental, and daily life of discipleship. This teaching is rooted in Scripture, both the Old and New Testament, as well as the living tradition of our Church. Pope Leo XIII began a series of encyclicals beginning with Rerum Novarum, dated May 15, 1891, which has been continued by successive popes, the conference of bishops and national bishop’ conferences to the current day. Almost 115 years after the publication of Rerum Novarum the Church sought to compile and summarize its modern social teachings. In 2004 the Pontifical Council for Justice and Peace published the Compendium of the Social Doctrine of the Church to summarize and restate the Church’s social teachings to serve as a reference for all Catholics. To promote the social dimension of the Gospel with a view to building the civilisation of love. CLICK HERE for most of the official social teaching documents of the Catholic Church and also a variety of resources to help you explore this rich body of moral teaching. An agency of the Irish Jesuit Province, the Centre undertakes social analysis, theological reflection and action in relation to issues of social justice, including housing and homelessness, penal policy, asylum and migration, and international development.